WEB Ventures executives say they are bringing women and minorities to the table on jobs that many times leave them out. CINCINNATI — When Andrew Haynes was a little boy, he discovered a passion for drawing. "As a kid, I would draw all the time," Haynes said. Like most kids, he also enjoyed video games. One in particular dealt with building skyscrapers. "I just had a big interest in buildings and how they're constructed." That combination led to an interest in architecture and design, which in turn led to an urban planning major at the University of Cincinnati College of Design, Architecture, Art and Planning. However, Haynes didn't find a job in his field until he got connected with the right people. "I'm fortunate 'cause I had a really good mentoring team, and that really led to some great connections," Haynes said. Today, Haynes works for Elevar Design Group, a minority-owned firm near downtown Cincinnati. But, as a planner, he's in a field that doesn't have many people of color. "When it comes to an actual contracting perspective, there aren't many minority-owned companies," he said. Several consultants in Cincinnati are working with companies to help them increase their rate of economic inclusion, which involves expanding the opportunities for minorities and women in business, employment and other segments of society. 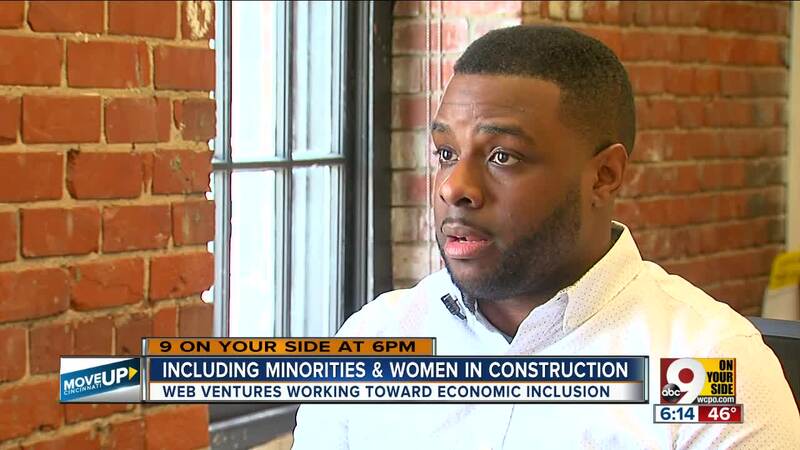 Corryville-based WEB Ventures is focused on economic inclusion in the construction field. "You're trying to change the minds of some developers," said Bill Witten, one of its founding partners. The consulting firm was created by three former Procter and Gamble managers: Witten, Howard Elliott and Henry Brown. One of their largest clients is Uptown Consortium. "It's to help them with their economic inclusion, workforce inclusion and wealth building component, all related to the Martin Luther King and Reading Road Innovation Corridor," Witten said. The Innovation Corridor is one of the largest development projects in the Cincinnati area. When completed, it is expected to comprise more than $1 billion in construction. "Think about it. The architect component alone on a project that's $100 million is somewhere between $3 and $4 million just for the architect," Witten said. "The developer says, 'I couldn't find anybody.' I'll help you find them," Brown said, pointing to himself. And those jobs are more numerous than some might guess: In addition to architects and builders, lawyers and accountants are critical parts of the process. "We go through everything that you're gonna do in your back office," Witten said. "It is going to have economic inclusion." WEB Ventures, Uptown Consortium and developers working on the Innovation Corridor have a community benefits agreement to guide their process toward greater inclusivity. "I can put six people in front of you, making it possible for you to make a reasonable choice for the hires that you're going to make, to be other than the people you always talk to," said Brown. Witten said they are making progress. For example, for the new University of Cincinnati Gardner Neuroscience Building, more than 40 percent of the construction contracts were awarded to women and minority suppliers. WEB Ventures works to make sure economic inclusion occurs during all phases of construction: pre-construction, construction and post-construction. The goals are aggressive, and WEB Ventures' founders said they have seen some resistance. "There are going to be people who are not going to be comfortable with this," Brown said . To critics who describe their efforts as tantamount to affirmative action, Brown calls it "deliberate action." "I'm not in the fight about affirmative action," Brown said. "That's not what I'm here to do. I'm here to help reach some goals that folks set." "It's a mind shift," Witten said. "No one's ever told them that the pre-construction is just as valuable as construction and post." The Innovation Corridor will include a number of projects such as UC, the National Institute of Occupational Safety and Health, office buildings, apartments, hotels and more. The job potential once everything is built is over 7,000 workers. WEB Ventures will play a role there as well. The firm plans to work with local educational institutions to develop curricula for specialized jobs in the growing high tech area in Avondale. "We need to get people in career paths," Witten said. "We don't talk jobs, we talk career paths." Meanwhile, Haynes said it was mentoring from Witten that helped him get his first job at an architecture and design firm. Haynes still hopes to grow in his field. "Design work is absolutely at the top of my list," Haynes said.